Alliance Bank Malaysia Berhad and its subsidiaries, Alliance Investment Bank Berhad and Alliance Islamic Bank Berhad, is a dynamic, integrated financial services group offering banking and financial solutions through its consumer banking, SME banking, corporate and commercial banking, Islamic banking, investment banking and stockbroking businesses. The Group provides easy access to its broad base of customers throughout the country via multi-pronged delivery channels which include retail branches, Privilege Banking Centres, Islamic Banking Centres, Business Centres, and Investment Bank branches located nationwide, as well as mobile and Internet banking. 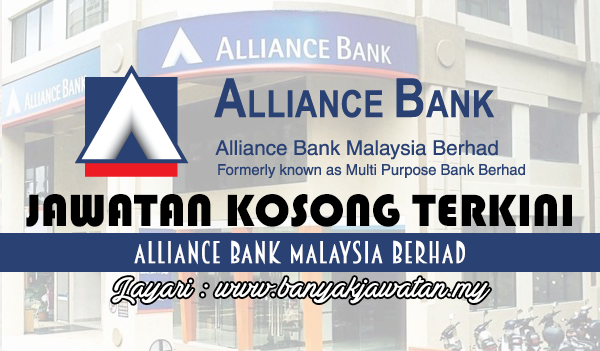 0 Response to "Jawatan Kosong di Alliance Bank Malaysia Berhad - 7 July 2017"